A few weeks ago Ben and Sienna had a little 'secret' which ended up being an expedition to the shop to buy me some flowers and a card. 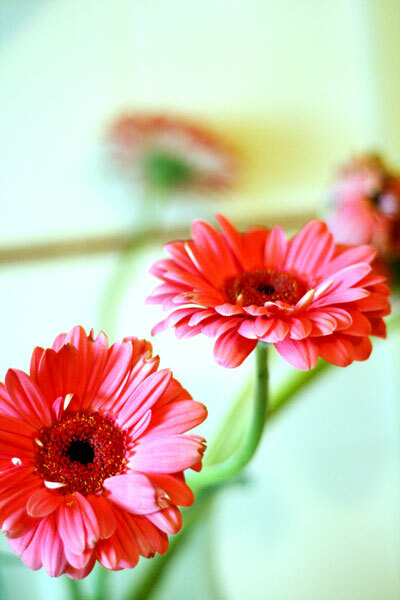 Sienna chose the flowers - pink gerberas - and there are still 5 in the vase now, they are remarkably long-lasting! This is a sneak peek of the baby corner in our bedroom. The chest of drawers were previously in Sienna's room, but we bought her a big vintage tallboy on ebay the other week, so this was spare. 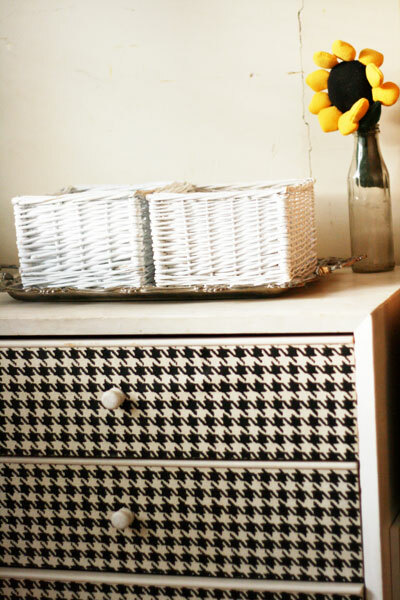 Ash "helped" me re-cover the drawers with vintage houndstooth wallpaper. This window seat is just adjacent to the baby corner, we have a bit of yellow coming in to the room now, I just recovered this last week and made some cushions for it. Sienna is enjoying the novelty of new cushions in the pic above! 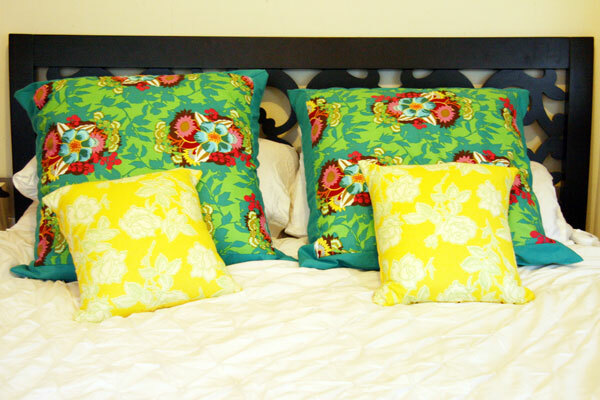 These fabrics are from the Heather Bailey Pop Garden range 'Wallpaper Roses' in both yellow and turquoise. These four cushions I made yesterday, along with another one for the window seat. It's been tricky getting good shots of the window seat in particular, as I keep forgetting to take them during the well-lit hours of the day! The fabric on the small cushions on our bed is the same as the window seat fabric, though the colour impression you get from the first photo (with Sienna in it) is more accurate - the top of the window seat anyway. The European cushion covers are made from the Anna Maria Horner fabric 'Garden Party Centerpiece' in turquoise, I bought all the patterned fabrics on etsy. 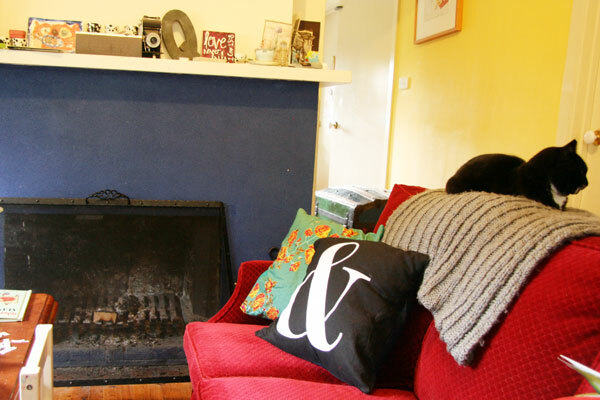 Since it's all about cushions at the moment, here is the cushion I just bought from etsy, from Australian seller Aunty Cookie - check it out here. 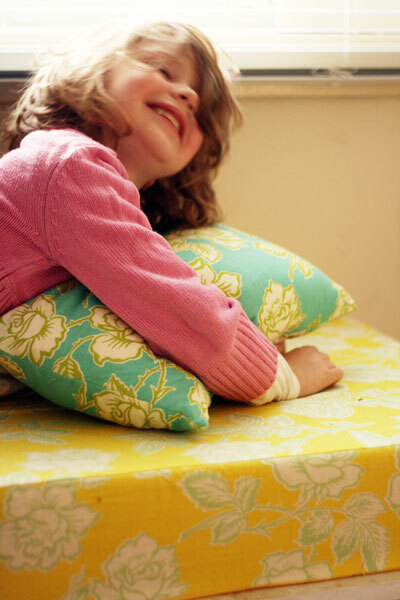 I made the four other cushions a few months ago from Anna Maria Horner fabric 'Social Climber - Teal'. 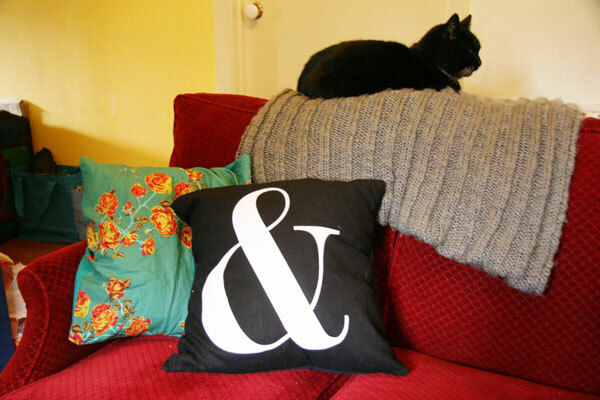 We just needed a fifth, totally different cushion to set things off and I have been really drawn to typography in decorating lately, so this was perfect. That throw rug keeps my legs cosy in the evenings, it is so warm and cuddly! There's a wider view of the lounge below, with the yellow kitchen walls sneaking into the background. We've been having lots of fires lately, which is nice. Mmm fire toast. And Neko sleeping on the back of the couch, as is pretty usual for him. The new SC should be out soon so I'll have a bunch of pages to share from that, and a project I've just finished for Willow Tree Crafts - a desk calendar. Creative stuff coming, promise!